Chapter 1: In this opening chapter we meet Jess Aarons, the novel’s viewpoint character, and his struggling family. Jess is the only boy in a family of four sisters, each of whom has their own special way of annoying Jess. The family is loud and stressed, and each is wrapped up in his or her own problems. As a refuge, Jess has a habit of taking early morning runs in preparation for the schoolyard races he competes in. His passion for running is clear, as is his desire for his family and especially his father to be proud of him. Near the end of the chapter Jess’s sister May Belle tells him that a new family is moving in next door—a fact Jess ignores but that is the catalyst for the rest of the novel. Chapter 2: Here we learn of Jess’s second passion—drawing—and we find out a little more about his school. Jess has a crush on his unconventional music teacher Miss Edmunds, who is the only person who recognizes and appreciates his talent for art. Jess’s father in particular thinks his drawing habit is girly and a waste of time. We also see the different ways Jess’s father interacts with his children: he is affectionate with his younger girls but dismissive of Jess. And finally, at the close of the chapter Jess meets his new neighbor, Leslie Burke, for the first time. Leslie seems a little odd, and it takes a while for Jess to decide if she is a boy or a girl, but once he figures out she’s a girl he is dismissive of her. Chapter 3: In this chapter we first see Jess and Leslie in their school, a place Jess finds as irritating as his home environment. Leslie is immediately alienated due to her casual mode of dressing for the first day of school. During recess Jess prepares for the big race he has been practicing for all summer, but everyone is shocked when Leslie decides to run with the boys and eventually beats all of them. Leslie shows her friendly nature, trying to connect with Jess, but he shrugs her off and tries to pretend he doesn’t care she beat him and doesn’t admire her skill at running. Chapter 4: The first week of school drags by for Jess, especially since Leslie continues to beat him and all the other boys at their recess races. He avoids Leslie, until a good mood brought on by a class with Miss Edmunds prompts him to reach out to her. They talk on the bus, and Jess learns that Leslie’s parents are writers and rich. Leslie is continually alienated at school and bothered by the school bully Janice Avery, but she and Jess become closer and find refuge in a forest they find by swinging over a creek. 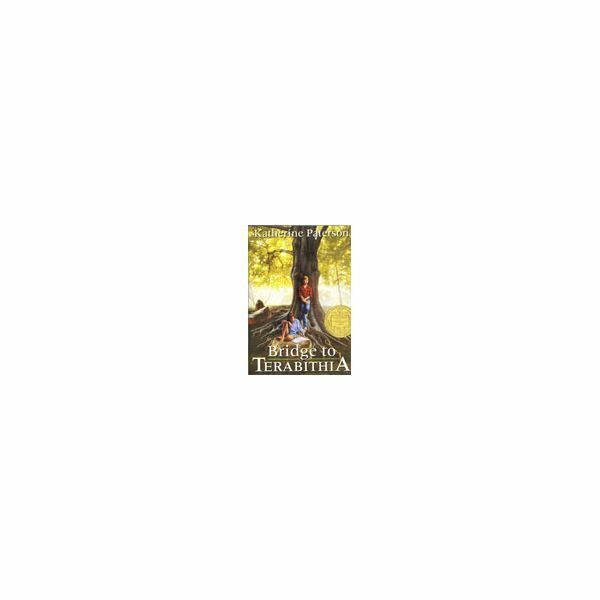 They name this forest place Terabithia, and it becomes a place where they can escape from their troubles at school and home. Chapter 5: Janice the bully steals little May Belle’s Twinkies, and May Belle begs Jess to do something about it. But Jess and Leslie know that fighting with Janice will only get Jess kicked out of school, so in Terabithia they form a different plan. They write a love letter to Janice, pretending it is from the boy all the seventh graders (including Janice) have a crush on, and arrange for Janice to meet this boy one day after school. Janice falls for their trick and is forced to walk home, much to May Belle’s delight. Chapter 6: It’ll be Christmas soon, and Jess has no money but desperately wants to find something for Leslie. At last he sees a stand with free puppies, and brings one to Leslie. Leslie is thrilled with the puppy and names him Prince Terrien, and gives Jess an expensive set of paints and paper in return. Jess’s family Christmas doesn’t go nearly so well, as his father becomes frustrated with the cheap car set he bought for Jess. Jess escapes the tension of his family to return to Terabithia with Leslie. Chapter 7: Leslie begins spending more time with her parents, especially by helping her father renovate their house, and Jess grows jealous until Leslie invites him to come home with her. Jess is at first wary of Mr. and Mrs. Burke, but warms to them and enjoys being with this family in a relaxed way he has never experienced in his own home. Later at school, Janice is found crying in the bathroom and Jess urges Leslie to talk to her. They discover that Janice’s father beats her and all the seventh graders found out, and Leslie tries to comfort and befriend the bully. At the end of the chapter Jess finds out May Belle followed him and Leslie to Terabithia, and is concerned she might tell on them. Chapter 8: Jess’s family plans to go to church on Easter (though they don’t have the money for new clothes) and Leslie asks to come with. Though Jess finds church dreary and boring, Leslie finds it and the story of Jesus magical. She is doubtful of May Belle claims that sinners go to Hell, and Jess isn’t really sure which of them he agrees with. Chapter 9: Jess and Leslie have been unable to go to Terabithia for a while due to rain, and when they finally return the creek they swing over is much higher. Jess becomes more and more afraid to enter Terabithia, though he doesn’t tell Leslie, and he has a difficult time immersing himself in their fantasy world like he usually does. They return to Jess’s house to watch television instead, but Jess is still concerned about Leslie swinging over the creek into Terabithia. Chapter 10: It’s the weekend, and Jess receives a call from Miss Edmunds inviting him to visit a museum with her. He is thrilled, and doesn’t invite Leslie along because of his crush on Miss Edmunds. He and the teacher spend a wonderful day at the museum, especially the art gallery, but when Jess returns home his family is frantic, not knowing where he’d gone. They are all obviously distressed, and Jess’s sister Brenda finally tells him that Leslie has died. Chapter 11: Jess learns that Leslie tried to swing over to Terabithia, but the rope broke and she drowned in the creek. Jess accuses his father of lying and runs from the house, until his father follows him in his truck and carries him into bed. Jess has difficulty sleeping or accepting the reality of what has happened, feeling guilt for not inviting Leslie to come with him and Miss Edmunds, and the next morning appears to have forgotten what happened. But the strange way his family is acting eventually reminds him, as does his father’s statement that they are going to the Burke’s house to pay their respects. Chapter 12: Jess and his parents visit the Burke’s house, and Jess seems detached from what’s happening until Leslie’s father hugs him and thanks him for being Leslie’s friend. When Jess learns Leslie is to be cremated he snaps and runs back to his house, where he has a confrontation with and hits May Belle. He runs to the creek and pours out the paints Leslie bought him for Christmas, and his father finds him there and tries to comfort him. Jess asks his father if Leslie will go to Hell, and Mr. Aarons tells him she won’t. At his house again, Jess is still grieving but is calmer, and is comforted when Mr. Burke drops off Leslie’s dog Prince Terrien. Chapter 13: The next morning Jess returns to the creek, and without Leslie wonders if the kingdom they created is gone forever. He makes a funeral wreath for Leslie and floats in on the creek, then finds May Belle trying to cross the creek on a tree branch. He rescues her and tells her not to be afraid. School is difficult for Jess to endure, though the strict Mrs. Myers surprises him with comforting words, and the Burkes move away. Jess has an idea, and uses the wood from the Burke’s yard to build a bridge over the creek into Terabithia. He brings May Belle across the bridge and tells her she is Terabithia’s new princess, and by these acts seems healed enough to move forward and begin to conquer his grief.